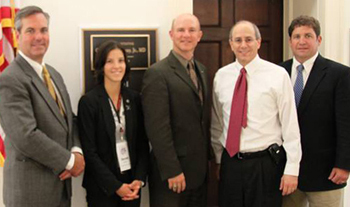 Congressman Charles Boustany, Jr., MD met with maritime industry and labor representatives during the second annual Maritime Industry Congressional Sail-In on May 4, 2011 in Washington, D.C. With Rep. Boustany here are American Maritime Officers member Capt. Robert Lansden (third from left) and President of CEO of Pacific-Gulf Marine Todd Johnson (left). Also in the picture are Sarah Branch, director of government relations for the Offshore Marine Service Association (OMSA) and OMSA President and CEO Jim Adams. In a statement released after the meeting with maritime representatives during the Maritime Industry Congressional Sail-In May 4, Rep. Boustany commended his colleagues, the 91 members of the House of Representatives who have co-sponsored the Realize America’s Maritime Promise (RAMP) Act (H.R. 104). The legislation would require Congress to each year appropriate funds deposited in the Harbor Maintenance Trust Fund (HMTF) for their intended purpose: maintenance dredging of U.S. ports and navigational channels. Annually, the HMTF – funded by the Harbor Maintenance Tax, which is assessed on imported and domestic cargo – accrues more than $1 billion, but only approximately half of those funds are used for maintenance dredging. This has created an enormous surplus, while the nation’s ports and waterways continue to degrade. The Great Lakes navigation system, in particular, has suffered from a lack of maintenance dredging in recent years. “Louisiana is a global leader in trade, and proper maintenance of our ports is critical for our exports to grow,” Rep. Boustany said. The RAMP Act was referred to the House Committee on Rules and the Transportation and Infrastructure Committee. Companion legislation was introduced in the Senate by Senators David Vitter (R-LA) and Mary Landrieu (D-LA). 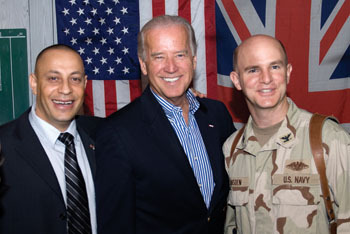 U.S Navy Captain Robert Lansden recently dropped in on a kindergarten class in Basra, Iraq. “I want to thank them for being such beautiful children,” he told a translator. For Lansden, a naval reservist, it’s been an unlikely journey that began on August 29th, 2005. 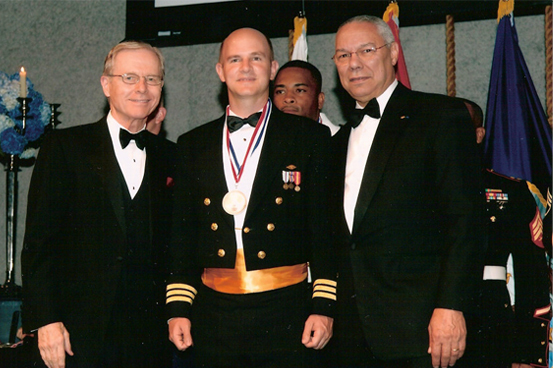 The day Katrina hit his hometown of New Orleans, Lansden was captain of the U.S.N.S. Pollux, a merchant marine ship docked on the riverfront for repairs. The Pollux happened to be marooned in New Orleans as Katrina roared ashore, undergoing repairs. Its engines were out, but it was loaded with several hundred thousand gallons of diesel fuel and fresh water. In a city that could not function, the Pollux was an island of modern convenience. Only miles from the Pollux, the situation at West Jefferson Medical Center was in sharp contrast. For days, the hospital staff and patients suffered with no electricity and no running water. Seemingly out of nowhere, Robert Lansden showed up at the hospital, offering help. “I was blessed to have that ability and to have ridden through the storm, to already be there,” he says. Lansden got permission from his navy bosses to share his supplies: diesel, water, even the ship itself. Dialysis machines and close to a dozen dialysis patients were actually loaded up from West Jeff and driven to the Pollux. After the Katrina experience, Lansden volunteered for duty in another country in need of rebuilding. 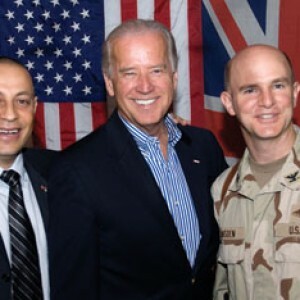 Today, he is director of CMOC, the U.S. Army’s Civil Military Operations Center, which rebuilds roads, schools and public buildings in some of the most dangerous areas of Iraq. Capt. Robert Lansden is flanked by former California Gov. Pete Wilson (left) and Gen. Colin Powell, former chairman of the Joint Chiefs of Staff and former Secretary of State, after Gen. Powell presented Capt. 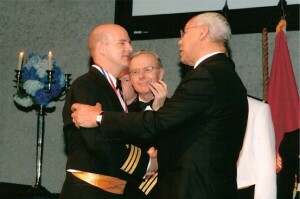 Lansden with the Silver Service Medallion for his “exemplary leadership” as master of the USNS Pollux during the Hurricane Katrina relief effort in New Orleans in 2005. Capt. Lansden was chosen to represent all U.S. merchant mariners who responded to the crisis. The Army, The Navy and the “first responder” police and firefighters were also represented by one individual from each service at the award ceremony at the World War II Museum in New Orleans. Corp. (AMSEA). Attending the ceremony for MSC were Rear Adm. Hugo Blackwood, vice commander, and John Henry. Master of the Pollux, authorization to make the ship’s resources available to the local relief effort. The Pollux became the source of fuel for the generators of area hospitals, pumping stations, water treatment plants, firefighting and military camps. With assistance from West Jefferson Medical Center, an emergency dialysis unit was set up in the ship’s laundry room. The ship’s engineers also helped the Audubon Zoo with potable water and assisted the aquarium and the local morgue with pumping, refrigeration, and mechanical systems. With its own air-conditioning, running water, and working toilets, the Pollux was a haven in 100-degree heat for emergency workers and families. Algol and Bellatrix provided housing and transport for emergency services workers on the Gulf Coast and, on their own time, the crew of the Bellatrix saved and cared for orphaned pets in the New Orleans area. The Pililaau provided housing, transportation and support for marines and paratroopers of the 82nd Airborne, who served in Louisiana, Texas, and Mississippi as part of Task Force Katrina, assisting disaster response agencies and victims of the hurricanes. Referring to the credo of the U.S. Merchant Marine, “In Peace And War,” Capt. Lansden said that, in war, merchant mariners will risk their lives to deliver the cargo because they know the people on the other end depend upon it. In peace, he said, these ships are a tremendous vehicle for helping people in a natural disaster. During the hurricane relief efforts, all five ships were operated by AMSEA and manned in all licensed positions by American Maritime Officers and in all unlicensed positions by the Seafarers International Union.